I’ve always been a fan of Lou Reed’s 198o album Growing Up In Public. I’ll be the first to admit that I hate starting off blog posts with the phrase I’ve always been a fan of…, but hey, it’s all I’ve got. Where are the words? After digging Transformer, Berlin, Coney Island Baby, and especially Street Hassle, I found Growing Up in Public at a thrift store and naturally expected to dig Lou’s foray into the 1980s. And I did, but I have a deep appreciation for corn. The production on this album was a clear departure from previous work. It’s more arranged. The back cover is a photo of his road band on a stage with their instruments- at least a dozen guys, looking they they’re about to seriously jam, Silver Bullet Band-style. Here are my two favorite tracks off the album, “The Power of Positive Drinking” and “My Old Man.” The latter is great, recalling Lou’s early Brooklyn childhood, and hero-worship of a father who turns out to be human after all. I’ve also included “Teach The Gifted Children,” which borrows from Al Green. I think a lot of fans thought he went super-soft with this album, but I like soft! 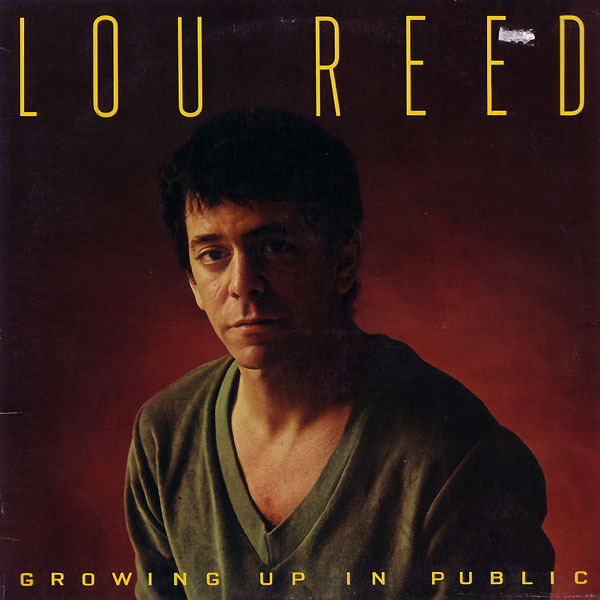 This entry was posted in Uncategorized and tagged Growing Up In Public, Lou Reed. Bookmark the permalink. Mickey Gilley has a good country song with the same name as the first featured track. Probably just a coincidence, given what an obvious (and funny) title it is. Sweet, I’ve got to check that one out, Paul! This man can NOT sing.